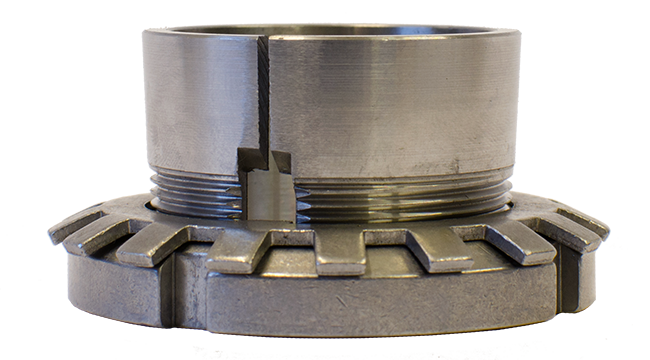 Adapter sleeves are the most commonly used components for locating bearings with a tapered bore onto a cylindrical seating as they can be used on smooth or stepped shafts. They are easy to mount and require no additional location on the shaft, usually supplied complete with lock nut and locking device such as a washer or clip. Lock nuts can be supplied in a wide range of sizes and can also be referred to as shaft or withdrawal nuts, depending on their use. They are used to locate bearings and other components onto a shaft as well as to facilitate mounting bearings on tapered journals and dismounting bearings from withdrawal sleeves. Lock nuts can be offered with several different ways of locking onto the shaft such as: Locking washers, Locking clips or Locking screws.